Buy Bakson's Homeopathy Spondy Aid For pain, stiffness and soreness in muscles of the back, arising from degenerative changes in the spine. 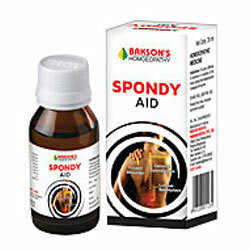 A Spondy Aid is useful in treating the diseases of the spine and back. This combination helps in reducing the pain and inflammation of the affected joints. It significantly reduces stiffness and radiating pain associated with Cervical and Lumbar Spondylosis, thereby improving the ability to function normally. It also reduces muscular spasm and frequency of pain thus restoring the general strength of the body. For pain, stiffness and soreness in muscles of the back, arising from degenerative changes in the spine. 10-15 drops should be diluted with water and taken 3 times a day. In acute cases take 2 hourly 6 times a day. Once improvement starts reduce the dosage to twice a day. Or as prescribed by the physician. Spondylosis' refers to degeneration of the spine. Most often, the term Spondylosis is used to describe osteoarthritis of the spine. This includes the discs or cushions between the vertebrae and the joints between the bones of the cervical spine. There may be abnormal growth or "spurs" on the bones of the spine (vertebrea). These changes can, over time, press down on (compress) one or more of the nerve roots. In advanced cases, the spinal cord becomes involved. Factor Small fractures to the spine from osteoporosis. In 'Cervical Spondylosis' pain may be felt over the shoulder blade or it may spread to the upper arm, forearm or (rarely) fingers. It is usually noticed to worsen after standing or sitting/at night/ with sneeze, cough or laugh/ bending neck backwards or walking more than a few yards. Other common symptoms include neck stiffness numbness or abnormal sensations in the shoulders or arms, headaches especially in the back of the head and loss of balance or vertigo. 'Lumbar Spondylosis' usually produces no symptoms. When back or sciatic pains are symptoms, Lumbar Spondylosis is usually an unrelated finding. Symptoms include tingling, numbness, weakness and pain that can spread through the lower back, tailbone, hip joints, buttocks, tighs, down the legs to toes and loss of bowel/bladder control. In 'Frozen Shoulder', the shoulder capsule thickens and becomes tight. Stiff bands of tissue -called adhesions - develop. In many cases, there is less synovial fluid in the joint. The hallmark sign of this condition is being unable to move one's shoulder - either with one's own effort or with the help of someone else, accompanied with pain initially which later spontaneously resolves. 'Spony Aid' with its novel formulation prevents degenerative processes of these joints and provides relief from stiffness of back and aches. It also helps liberates one from other accompanying symptoms like vertigo, nausea, giddiness and weakness. Acid formicum : Chronic arthritis of traumatic nature can be treated by formic acid. Pains usually worse on right side, motion and better from pressure. Colchicum autumnale : It markedly affects muscles, fibrous tissue, serous membranes, joints especially the small ones. Tearing pains, worse in the evening at night and from touch and from least motion. Rhus toxicodendron : Suited for affections of nerves and spinal cord, stiffness of muscles and joints. Stiff neck with painful tension, when moving. Back strain or injury. Pains from overlifting and overuse. Pain and stiffness in small of back, better motion or lying on something hard. Ledum palustre : It affects the fibrous tissue of joints especially small joints. Rheumatism begins in lower limbs and ascends. Trembling of hands when moving them or grasping anything. Throbbing in right shoulder, on raising arm. Dulcamara : Rheumatic troubles induced by damp cold are aggravated by every cold change and somewhat relieved by moving about. Stiffness, numbness, aching and soreness of muscles on every exposure to cold especially of back and loins. Gelsemium semp : It centers its action upon the muscles and motor nerves. In muscles it causes overpowering aching, tiredness, heaviness, weakness and soreness, especially felt in the muscles of the limbs. Dizziness, drowsiness, dullness and trembling. Ulmus fulva : It is much used for lessening pain in inflammation. Take with Bakson's Rheum Aid Tablets for best results.